* This review may contain spoilers for the previous books in the Throne of Glass series. To Sum It Up: At last, Aelin Ashryver Galathynius of Terrasen is ready to say goodbye to her life as Celaena Sardothien and reclaim her kingdom. But her battle for her throne still requires some of Celaena’s unparalleled, deadly skills as an assassin to outmaneuver the King of Adarlan—and to settle some old debts along the way. Every second that passes brings the king one step closer to engulfing the world in unimaginable evil, and only Aelin’s fire stands a chance of stopping him. My mind is still reeling from this book, still trying to grasp, futilely, I might add, everything about Queen of Shadows. EVERYTHING. I could have reread the first three Throne of Glass books one hundred times each; that still would not have been adequate preparation for what takes place in Queen of Shadows. Apologies in advance for all of the vagueness that’s about to follow, but it’s almost impossible to go too far in depth discussing this book without running into spoilers. Every page, every paragraph, every sentence, every word is so deliberate, so carefully plotted. There is not a single ounce of throwaway in this 600-plus page tome. Every move that Aelin Galathynius, formerly known as Celaena Sardothien, makes is a piece of her intricately constructed master plan to take down the King of Adarlan and reclaim her rightful place on the throne of Terrasen. It’s one hell of a journey home for our queen, whom I bow before because of her infinite strength and bravery and resolve. All hail Queen Aelin! I’m a rip-off-the-band-aid type of person, so I’ll cut straight to admitting that although foreshadowing in Heir of Fire led me to expect a certain turn of events in Queen of Shadows, I struggled with how they played out. I’m fine with the outcome, really, but the path that the story took to get there—it was tough to watch. I’ll also say, though, that a pivotal scene toward the end of the book helped me to view what happened before in a different light and as a prime illustration of one of the novel’s dominant themes: irrevocable change. Aelin more than makes good on her vow to rattle the stars; her sheer force of will alone is enough to cause the stars, the earth, and the entire universe to quake. Add some characters with formidable powers of their own (I’m looking at you, Rowan), some characters with suspect motives and loyalties, and some utterly reprehensible characters, and there’s no way that the world, as is, escapes unaltered. Story arcs that have been simmering in the previous books converge and combust here. The action and the confrontations are explosive. I actually put the book down a few times because I couldn’t handle the tension and needed a moment to collect myself before reading further. By the time that I reached the book’s final sentence, I was completely dazed by the magnitude of it all. I absolutely loved all of the nuances of gray to a lot of the characters in Queen of Shadows. Clear-cut heroes/villains aren’t nearly as intriguing to me as characters who walk a fine line between being both. I love their unpredictability and how they can upend the story in an instant. Much love and adoration go to Sarah J. Maas for also writing some of the toughest, most badass female characters in fantasy, and I’m not just talking about Aelin here. I’ve read some truly brilliant books this year, but only this one has thus far stirred such a spectrum of emotions. I burst out laughing at Aelin’s smartass remarks. I almost burst into tears over one of my beloved characters. I became seriously scared quite a few times because the novel ventures into some very dark places. This series has matured so much since Throne of Glass, and just when I think that it can’t possibly impress me any more, the newest installment blows me away into oblivion. I’m still picking up the shards of my heart in the aftermath of the relentless hammering that this book delivered. But of course I’m ready to endure the pain all over again when the next novel arrives. All in All: Make sure that you eat, drink, sleep, use the bathroom, whatever—before sitting down to read Queen of Shadows because you will NOT want to be parted from it for long. You will want to keep reading and reading without pausing. EVER. And then you’ll need some additional time once you’re finished reading to recover from the trauma that you’ve just experienced. My advice: seek out a post-QoS support group beforehand because you will need it. Yea! Yes! Yes! How and where did you find the words to articulate how awesome this was? I was rendered speechless!! I promise I was sobbing when I thought you know who died!! OMFG, I was in hysterics too! And my poor heart is still recovering, lol! Such a marvelous review! You summed up the feeling this book delivers so well with spoiling anything for those that haven't read it. I just love Maas' ability to create astonishing female heroines as well. I can't even begin to imagine how we will feel after the next two, with how intense this one ended up being. I didn't want to talk about anything else but Queen of Shadows for a while after I read it. The characters are AMAZING! I am thrilled that they each are good and bad in their own rights and have to own who they are. I am thrilled with how all the threads were brought together and just can't wait to see where we go from here. Fantastic review!! I STILL want to talk about nothing but QoS, lol! This has been a tough one to get over, that's for sure! :D I love, love, love how so many of the characters have both good and bad to them; it makes them so much more complex and fascinating to read about. 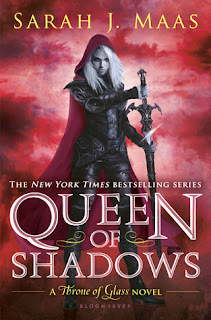 I hope that the time until the next book releases goes just as fast as it did between Heir of Fire and Queen of Shadows because the suspense is just killer!